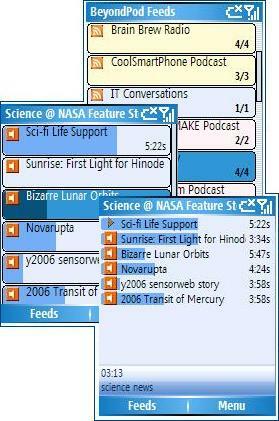 BeyondPod freeware for smartphone, Windows mobile phone free downloads. � Summary: BeyondPod is FREE, Open Source, RSS feed reader and podcast manager (podcatcher) for Microsoft Smartphone and Pocket PC. 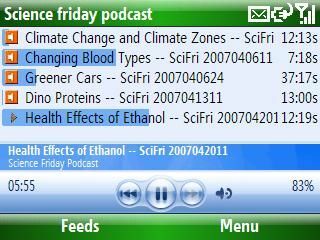 Using BeyondPod you can subscribe for RSS feeds, read the feed content, download and listen to associated podcasts (enclosures) directly on your mobile device. BeyondPod also provides a convenient way to play downloaded podcasts using a built in media player with features like configurable "TiVo style" commercial skip, tracking of played time, easy cleanup of played podcasts and many others. I've tested a lot of RSS readers for windows mobile and this one just rocks! The site was down for me. Anyone else?